2010 Update to Preferred Stock Investing Now Available! Readers of my book, Preferred Stock Investing, Third Edition, are entitled to free periodic updates to the preferred stock tables presented throughout chapter 15 of the book as long as the Third Edition is in print. Providing free periodic updates helps keep readers of Preferred Stock Investing up to date. The 2010 update to Preferred Stock Investing is now available! And I am also happy to announce that as a special service to readers, the 2010 update goes beyond an update to the preferred stock tables found in chapter 15. In this update I also take the opportunity to provide you with the results of the "CDx3 Income Engine" (the preferred stock investing method explained throughout the book) as implemented throughout the Global Credit Crisis (2007 - 2009). The nature of the preferred stock market since June 2007 deserves special attention and the 2010 update to the book would not have been complete without wrapping up the method's performance during these historic (extreme) conditions. Chapter 18, "The CDx3 Notification Service": five new preferred stock investing resources have been provided to subscribers to the CDx3 Notification Service (my preferred stock email alert and research newsletter service) since the Third Edition was published. Preferred Stock Investing, Third Edition is one of the most highly reader-rated books of any kind available for sale in the United States. To receive the free 2010 update to Preferred Stock Investing, Third Edition just follow the instructions on the first page of chapter 15 in the book. If you have yet to pick up your copy of Preferred Stock Investing, Third Edition you can do so at any of your favorite online retailers (see retailers). Please pick up your copy today then follow the instructions on the first page of chapter 15 to download the free 2010 update. I look forward to reporting back to you in next month's issue of the CDx3 Newsletter. Welcome to all of the new CDx3 Newsletter readers who signed up over the last month. This is your first issue of the CDx3 Newsletter, a free monthly newsletter devoted to the interests of CDx3 Preferred Stock investors. What Is A "CDx3 Preferred Stock?" CDx3 Preferred Stocks are regular preferred stocks that are able to meet the ten selection criteria described in chapter 7 of my book, Preferred Stock Investing. Applying the CDx3 Selection Criteria eliminates about 90% of the regular preferred stocks trading on today's stock market leaving just the highest quality issues. 3. be rated "investment grade" by Moody's Investors Service. Having specific and consistently applied selection criteria takes the emotion out of your investing decisions and leaves you with the highest quality preferred stocks - "CDx3 Preferred Stocks." I am a preferred stock researcher and author of the book titled Preferred Stock Investing. I also publish two monthly newsletters that describe my ongoing preferred stock research. My academic background is in economics and statistics. I retired from my position as Managing Director at one of the world's largest management consulting firms in 2002 to focus on preferred stock research. I do not sell preferred stocks nor am I a stock broker or financial adviser. As a researcher, I research the market price behavior of the highest quality preferred stocks and write to you about my observations. On September 17 Standard & Poor's began a three month process to substantially rework ("rebalance") the list of preferred stocks that make up its S&P U.S. Preferred Stock Index. Since the iShares Preferred Stock Exchange Traded Fund (PFF | quote) is pegged to this S&P Index, iShares will be buying and selling substantial quantities (millions of shares) of these preferred stocks over the next few weeks as well. This massive and short-term adjustment has shined a very bright light on eight specific preferred stocks. The S&P U.S. Preferred Stock Index is just that - an index (a number), much like the Dow Jones Industrial Average or the S&P 500 numbers that we see every day that give us an idea of how the market is doing, in whole or in part. Every day, Standard and Poor's takes the market prices of the list of preferred stocks that make up their S&P U.S. Preferred Stock Index and run them through a formula to get the daily Index value. Investors cannot invest (buy shares) in an index. That's where the iShares PFF fund comes in. The good folks at iShares have built a fund (similar to a mutual fund) that is composed of the preferred stocks used by the S&P U.S. Preferred Stock Index. Investors so inclined then purchase shares of the fund, giving them an interest in all of the preferred stocks that make up the fund (read about investing in preferred stock Exchange Traded Funds). So when S&P makes changes to the preferred stocks that go into their Index, the PFF managers at iShares make corresponding adjustments to the fund by buying or selling shares. In this way, PFF is able to meet its primary objective of mimicking the daily movements of the S&P U.S. Preferred Stock Index. If we were just talking about a few shares here and there, there would be no need to bother with this. But that's not what we're talking about this time. S&P is adding over 200 individual preferred stocks to their Index plus changing the weights assigned to each preferred in the new mix. And this major reconfiguration is going to be completed in November. That means that the managers of the iShares PFF fund will be buying and selling millions of shares over the next two months which, as you might guess, creates a significant opportunity for preferred stock investors who know (a) which preferred stocks are going to be involved and (b) for how many shares. Take a look at this example. Wells Fargo has a preferred stock that trades under the symbol FWF. FWF is a trust preferred stock (TRUPS) with a declared annual dividend rate (coupon) of 6.25%. Prior to the rebalance, S&P assigned a weight of .22 to FWF in its Index and iShares PFF held about 492 thousand shares accordingly. But under the new rebalanced Index, S&P will be assigning a weight of .65 to FWF. In other words, the importance of FWF in the S&P U.S. Preferred Stock Index is going to roughly triple over the next two months. Remember that the total net asset value of PFF does not change with these adjustments, so changes in the S&P Index lead directly to corresponding buying and selling of individual preferred positions within the fund. Assuming that the managers of the iShares PFF fund continue to configure PFF in lock-step to the Index, iShares will have to increase its stake in FWF to about 1.4 million shares by the end of November. That's a buy of over 922 thousand shares (see Table 1). Purchasing this many shares over a relatively short period of time puts upward pressure on the market price of FWF, a consideration that may be important to you as a preferred stock investor when considering a purchase or sale in your own portfolio. To continue this example, there is another, long-term consideration as well with FWF. FWF (a non-CDx3 compliant preferred stock) has a call date of June 15, 2012. That's prior to January 1, 2013 which is when the provisions of section 171 of the Wall Street Reform Act kick in (see the Special Announcement article below for an explanation of why this is important to preferred stock investors). As a Big Bank-issued TRUPS, section 171 makes it extremely likely that Wells Fargo is going to call (buy back from you at $25.00 per share) FWF on or near January 1, 2013. Since FWF is currently selling for $25.48, there is likely to be downward pressure on its market price as January 1, 2013 approaches (toward $25). This example shows how we can combine the new S&P Index weights with data from the iShares PFF Exchange Traded Fund and section171 of the recently-signed Wall Street Reform Act to inform short- and long-term purchase decisions of select preferred stocks. As shown by the FWF example, by applying the new S&P Index weights to the current preferred stock holdings of the iShares PFF fund, we can identify (a) which specific preferred stocks iShares will likely be buying and selling over the next two months and (b) the approximate number of shares for each that will be involved. These data give us a list of preferred stocks that are likely to be bought or sold by iShares in significant quantity over the next two months. By applying the ten preferred stock selection criteria from chapter 7 of my book, Preferred Stock Investing, the list can then be tightened down even further to just the highest quality, highest rated preferred stocks. Then, lastly, to position yourself for a downstream capital gain (on top of the great dividend income that these preferreds pay), we just want to see preferred stocks that are currently available for less than $25 per share. The eight preferred stocks shown on Table 2 are the preferred stocks that (1) would have to be bought or sold by iShares over the next two months in order to keep the PFF fund in sync with the new S&P U.S. Preferred Stock Index (its stated fund objective); (2) are among the highest quality, highest rated preferred stocks available and (3) are currently available for less than $25 per share (October 1 prices). Take a look at the first two preferred stocks listed on the table, PFD-A and PFD-B (note that to protect the values of subscriptions to the CDx3 Notification Service, my preferred stock email alert and research newsletter service, the trading symbols used here are fictitious. Subscribers can find the trading symbols on the CDx3 Discussion Group). Notice the massive number of shares that iShares will presumably be purchasing over the next two months (if they want to keep PFF in sync with the new, rebalanced S&P Index). That means that there will be upward pressure on the market prices of these two preferred stocks between now and the end of November beyond what there might have been otherwise. But there is a longer-term aspect of these two preferred stocks that should be of interest to buyers as well. Both PFD-A and PFD-B are Big Bank-issued trust preferred stocks (TRUPS) that, come January 1, 2013, will be subject to the provisions of section 171 of the recently-signed Wall Street Reform Act. As such, these two preferred stocks, available for less than $25 today, will almost certainly be called by their issuing banks (in which case, shareholders will receive $25 per share from the issuing bank). While S&P's rebalancing of their U.S. Preferred Stock Index provides some short-term price protection for investors in these two specific preferred stocks, there is also a layer of long-term price protection courtesy of the Wall Street Reform Act. 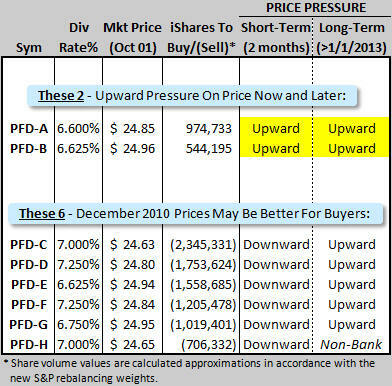 Both the rebalancing that is just getting underway and the provisions of section 171 of the Act are putting upward pressure on the market price of PFD-A and PFD-B as indicated on Table 2. In addition to shining a bright light on purchase candidates, these data from S&P and iShares also allow preferred stock investors to identify specific preferred stocks that might be better off purchased in December rather than right away. In addition to making large scale purchases of some preferred stock issues, iShares will also be selling off some positions in order to reflect lighter weights assigned by S&P. This large volume selling activity, all to be completed by the end of November, is likely to put short-term downward pressure on the market prices of the preferred stocks that S&P is deemphasizing under the new formula. Take another look at the bottom six preferred stocks on Table 2. These are all great preferred stocks; they too meet all ten of the preferred stock selection criteria from chapter 7 of Preferred Stock Investing and each pays respectable dividend returns (have you checked the interest rates offered by bank CDs lately?). Preferred Stock Investing includes the information, websites and other resources needed for you to be a very successful preferred stock investor. For those who would rather someone else do the research and calculations, I offer the CDx3 Notification Service. Subscribers to the CDx3 Notification Service receive an email alert when there are buying and selling opportunities coming up. Subscribers also receive their own non-promotional preferred stock research newsletter every month, have their own website that hosts the CDx3 Preferred Stock Catalog and have access to the CDx3 Discussion Group, the only online forum just for preferred stock investors. Invest in the best. Subscribe to the CDx3 Notification Service (see reader comments) today. Already a subscriber? Check out the CDx3 Discussion Group on the subscriber's website for this table's trading symbols. This table presents an updated list of Big Bank-issued trust preferred stocks (TRUPS) that will be among the first affected by section 171 of the Wall Street Reform and Consumer Protection Act, signed into law on Wednesday, July 21, 2010. Section 171 creates the largest single opportunity for preferred stock investors in history (how's that?). And like most investments, the highest returns will tend to favor those who get in earlier rather than later. The new law prohibits Big Banks (assets greater than $15 billion) from counting their TRUPS in their "Tier 1 Capital" calculation, a measure regulators watch when assessing the adequacy of a bank's reserves. These Big Banks are therefore likely to retire ("call") their TRUPS. Investors who hold shares of a TRUPS when it is called will receive $25.00 per share, so investors who purchase shares now for less than $25 position themselves for a capital gain on top of the above-average dividend income that they will be earning in the meantime. The far right column of this table shows you the effect that adding a capital gain onto the regular quarterly dividend income has on your Effective Annual Return...courtesy of the U.S. Government. By watching this list each month, you will be able to monitor this opportunity as the January 1, 2013 implementation date approaches (expect prices to generally increase toward $25.00 per share). Since market prices change every day, the list of affected TRUPS selling for less than $25 per share changes as well. So I will provide you with an updated list in this Special Announcement article every month. These are the highest rated, highest quality issues that are going to be first affected by section 171 of the new law that are also selling for less than $25 per share right now. Subscriber's to the CDx3 Notification Service (my preferred stock email alert and research newsletter service) are provided with this same TRUPS list, including the trading symbols, on page 7 of each monthly issue of the subscribers' newsletter, CDx3 Research Notes. Please consider becoming a subscriber to the CDx3 Notification Service today. As the most comprehensive research service available for the highest quality preferred stocks, all of the large, and many smaller, brokerage firms subscribe to the CDx3 Notification Service. My Preferred Stock Investing Group Materials are intended for brokers with a group of clients or self-directed investment groups that are interested in learning something about preferred stock investing. The Preferred Stock Investing Group Materials include a slide show (27 slides, PowerPoint Show format) and an accompanying handout that provides my commentary for each slide. The handout is available in color and black and white (PDF format) for easy printing. You will receive an auto-reply email message with current download instructions. (Already a subscriber? Check out the current issue of the subscriber's newsletter, CDx3 Research Notes, for symbols). Who Are These Companies That Issue CDx3 Preferred Stocks? Hawaiian Electric is a $2.15 billion Honolulu-based company that owns the Hawaiian Electric Company and American Savings Bank. HE has continuously paid a common stock dividend to its shareholders since 1901 and, through Hawaiian Electric Company, provides 95% of the electricity to the Hawaiian Islands. The Hawaiian Electric Company faces some unique challenges due to is geographic location and isolation. Mainland utilities have the ability to meet demand cycles by sharing electricity over long-distance transmission lines. Since doing so in the Hawaiian Islands is not possible (being islands), each island must be able to meet all of its electricity demand needs independently. Shifting population and usage present difficult cost and infrastructure challenges that most other utilities do not face. 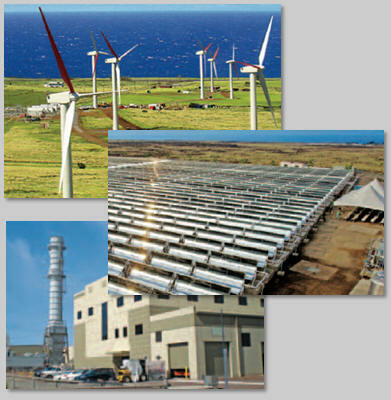 In addition to these challenges, the state of Hawaii launched an aggressive initiative in 2008 to transition its fossil fuel-based energy infrastructure to renewable resources. Specifically, the state's goal is to meet 70% of its energy needs (including transportation) from renewables by 2030. The big island of Hawaii appears to be well on its way with energy from wind, geothermal, biomass, hydro and solar already providing 30% of the island's needs. Customer-sited renewable energy is also a cornerstone of the utility's supply initiative. But by pushing generation to customer sites (such as solar and wind), revenues from an outdated usage-based model were starting to have a negative impact on the company's financial performance. Customers who historically purchased electricity from the utility (at profitable rates) have suddenly stopped doing so. HE rightly informed regulators that as their state's renewable initiative unfolds over the next 20 years, this legacy revenue model will ultimately bankrupt the utility. In February of this year, the Hawaiian Public Utilities Commission approved a new revenue model for Hawaiian Electric Company that decouples the utility's revenues from the amount of electricity sold (see press release). Rather, the new model pegs rates more directly to the utility's costs. Learn more about Hawaiian Electric Industries: Company website | Profile | Upgrades/Downgrades | Recent News. Reader Note: The purpose of the CDx3 Company Spotlight article is to give you a sense of the types of companies that issue CDx3 Preferred Stocks. Companies that appear in the CDx3 Company Spotlight either currently, or in the past, have issued CDx3 Preferred Stocks. Since I am not familiar with your financial goals, resources or risk tolerance, my mention of these companies here should not be taken as a recommendation by me for you to buy, or not buy, securities issued by these companies. Companies can issue multiple series of preferred stocks, some of which may meet the CDx3 Selection Criteria while others do not. What is the lowest preferred stock dividend rate that I can buy and still have some price protection? Historically, the dividend rates offered by the highest quality preferred stocks (those that are able to meet the ten selection criteria from chapter 7 of my book, Preferred Stock Investing) range between 6% and 9% with very few exceptions. The most recent new issues of such preferred stocks offer an average annual dividend of 6.825% which is very consistent with the long-term average of 7%. I receive email messages from preferred stock investors who, before they knew better, purchased a low dividend paying preferred stock some years ago for about $25. Since dividend rates have been higher ever since, the market price of these low-payers has never been above $25 since the day they were introduced. Those who purchased such shares wonder if they are going to be stuck with these low-payers forever with no chance of getting their principal back. 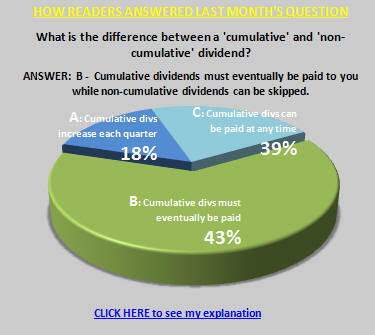 The question this month for preferred stock investors: What is the lowest preferred stock dividend rate that I can buy and still have some price protection? (A) 6.0% since preferred stock dividend rates rarely fall below this level. (B) 6.5% so that I avoid buying at the bottom. (C) 7.0% since this is the long-term average dividend rate paid by high-quality preferred stocks. The correct answer to this question is (B), 6.5%. While there is nothing wrong with a 6.0% dividend, when dividend rates come back up off of 6.0%, holders of 6.0% issues will often find themselves unable to sell them without a capital loss. By simply putting a floor at 6.5% preferred stock investors will avoid purchasing preferred stocks that they cannot, over time, sell and recover their principal. Remember that the dividend rates being offered by new preferred stocks move up and down over time between 6% and 9%. When a new preferred stock is introduced, its opening market price is always $25 (we're talking about preferred stocks that are intended to be purchased by individual investors here, not the $1,000 per share securities that are purchased by the government or big pension funds). As dividend rates rise above 6.0%, market prices for those 6.0% preferred stocks will tend to fall below $25 and will stay there until dividend rates come back down to 6.0% some day. Just as preferred stock dividend rates rarely reach 9%, they rarely fall all the way to 6% either. So if you purchase a new preferred stock that pays a 6.0% dividend, you are likely to be holding onto it for quite a while. If you ever hear a disappointed preferred stock investor grumbling about having purchased shares some time ago that they can never seem to sell without a loss, ask them what the dividend rate is. The answer will be a rate less than 6.5%. By building in a .5% cushion above the bottom historical rate, you will always be holding preferred stocks that carry a certain amount of built-in price protection. When dividend rates fall below 6.5%, holders of such issues that pay 6.5% or higher will find themselves holding preferred stocks with market values that tend to be greater than $25, affording you an opportunity to sell and regain your principal. Since dividend rates rise and fall multiple times over any five-year period (the lifespan of a preferred stock, IPO date to call date), you will be afforded multiple selling opportunities of preferred stocks that have a declared dividend rate (coupon rate) of 6.5% or higher. Those who pay $25 for a newly issued preferred stock that pays a 6.0% dividend are likely to be holding onto their shares for quite some time. 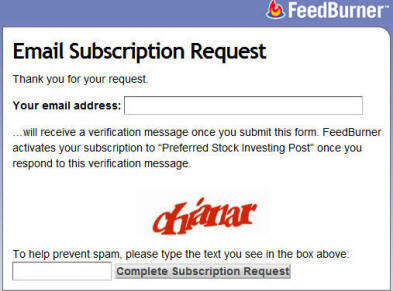 You can submit your own preferred stock question: Submit your question. Readers do not have to wait until next month's issue of the CDx3 Newsletter to stay plugged into the market for high-quality preferred stocks. Preferred stock research articles, marketplace observations and preferred stock news from the financial press and other information are posted to the Preferred Stock Investing Reader's Forum (my "blog") throughout the month. A separate window from FeedBurner (a Google service) will open on your screen. Enter and verify the email address that you want articles from the Forum to be emailed to as instructed. And don't worry - you'll never receive any spam from me and your email address will not be shared. By receiving the articles as I post them via email, you do not have to visit the Forum in order to stay plugged into my research regarding the marketplace for the highest quality preferred stocks. You are also invited to visit the Forum and comment on my articles. Please accept my invitation to receive articles by email and visit the Forum. During September, international banking regulators came up with a proposal that the reserves held by banks be increased from 2% of assets to 7% by 2019. Banks were quick to point out that removing over three times the amount of capital from the economy was an odd way to stimulate growth. Undeterred, the regulators are hurrying to have a document ready by the G20 summit meeting in November. While the extend to which (if at all) the U.S. will adopt the proposal remains unclear, it seems fair to say that we have yet to see the end of the screws being tightened on our Big Banks. The Wall Street Reform Act signed last July removed the primary reason that Big Banks issue trust preferred stocks (TRUPS). Effective January 1, 2013, TRUPS will no longer be allowed to be counted toward a Big Bank's reserves (specifically a metric called "Tier 1 Capital"). So while the Act disallows a major chunk of bank capital from being counted, we now have Basel III substantially raising the bar at the same time. For preferred stock investors who own Big Bank-issued TRUPS, any doubt you may have had that our Big Banks will start redeeming (calling) their TRUPS come January 1, 2013 should be fading very quickly. Remember, in the event of a call, all shareholders will be paid $25.00 per share. Investors who purchase Big Bank-issued TRUPS for less than $25 per share will position themselves for a nice capital gain on top of the great dividend that these securities pay out. All of which makes the table seen in the above Special Announcement article very interesting to watch each month (the table lists the highest quality preferred stocks that are currently available for less than $25 per share). Under pressure from the Act and now from Basel III, our Big Banks have cried foul. They are rightly pointing out that they issued these TRUPS to begin with under a certain definition of Tier 1 Capital only to now have the government change the definition. During September, bank representatives noted that a rarely used provision found within their TRUPS prospectus terms states that if the government should change the calculation of "regulatory reserves" (which is exactly what the Act does), the banks have the right to redeem their TRUPS within 90 days. While there is some debate over exactly when that 90 day window starts, consensus appears to be growing that the 90 day window that banks would be allowed to start performing "early calls" of their TRUPS starts when the definition change takes affect (January 1, 2013) rather than when it was signed into law (July 21, 2010). Expect to hear more about the Basel III proposal as the G20 summit convenes in November. 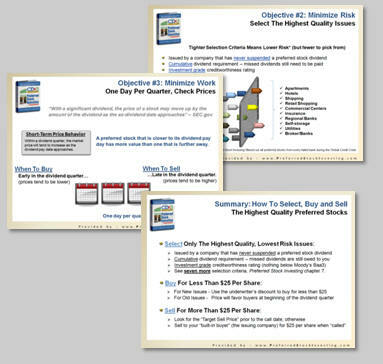 Learn to screen, buy and sell the highest quality preferred stocks by purchasing the third edition of my book, Preferred Stock Investing (see retailers). The book identifies the resources that you need to be a very successful CDx3 Investor completely on your own. If you would rather we do the research and calculations for you I offer the CDx3 Notification Service (see reader comments). Chapter 15 of Preferred Stock Investing includes a list of all of the CDx3 Preferred Stocks issued since January 2001 and the investing results you would have achieved had you invested in them using the CDx3 Income Engine. And readers also receive free periodic updates to the preferred stock lists in chapter 15 as long as the Third Edition of the book is in print. and they will automatically begin receiving this monthly CDx3 Newsletter next month (plus a CDx3 Special Report) - all FREE. CD Times 3, CDx3, CDx3 Income Engine, CDx3 Investor, CDx3 Portfolio, CDx3 Preferred Stock, CDx3 Perfect Market Index, CDx3 Bargain Table are trademarks of Doug K. Le Du. All rights reserved. Company logos are trademarks of the indicated companies. Service Marks (SM) are service marks of the indicated companies. DISCLAIMER: The content of this CDx3 Newsletter is to be regarded as educational, rather than advisory. There can always be exceptions to trends and/or generalizations that may be discussed herein. Consider your financial resources, goals and risk tolerance before investing. You, and not Doug K. Le Du, are solely responsible for your own investment decisions.